The exhibit features more than 25 spectacular quilts drawn from one of the country’s preeminent private collections and showcases art quilts that are inspired by the common theme of water. The quilts featured in the exhibit combine innovative methods of construction with nontraditional materials and techniques. The site lists links for shop maps, events, blogs, services, guilds, speakers, internet shops, and shops along your travel route. I recently joined an interesting new website called QuiltingHub. QuiltingHub is maintained by quilters for quilters. I see it becoming the central hub of quilting information where we can share our local events, shops, guilds, associations, museums, service providers (including guild speakers) and manufacturers with each other. It will be very nice to be able to travel or move to a new area and get an easy and accurate idea of the events, shops and other quilting resources in any given area worldwide. “Maps” was on exhibit at the International Quilt Festival of Long Beach 2013 Show in August. The pieces are of maps and our lives intersecting. The exhibit was sponsored and coordinated by Quilts on the Wall. This Smilebox slide show is presented by The Quilt Show. Sacred Threads is a juried quilt exhibit. These thought-provoking art quilts explore a range of human experience: joy, inspiration, spirituality, healing, grief, and peace. A companion exhibit called Artistry in Nature, will feature 17 quilts by local artists of the Midwest Fiber Arts Alliance. Check out the site. There might be something there that you would like to make. The Worldwide Textile Trade, 1500–1800 will be at the Metropolitan Museum of Art in New York City September 16, 2013–January 5, 2014. The exhibit features textiles from around the world, including examples created and traded for spices and other exotic goods from the sixteenth century to the eighteenth. These are just a few of the pieces that will go up for auction on Monday, September 9th at 2PM EDT in the benefit auction for SAQA (Studio Artists Quilt Association). 1. The artwork is gorgeous! 2. Prices range from $750 to $75 so there’s something for everyone’s budget. 3. They’re small so it’s easy to find a home for them. 4. They make great gifts! 5. 100% of the proceeds goes to support SAQA’s exhibition program! There are 421 gorgeous pieces of art up for bid. Bid early and often to help promote the art quilt! Mickey Lawler has been painting on fabric using Setacolor paints for many years. Her beautiful fabric is for sale at large shows. You can see some of her quilts on this Smilebox slideshow presented by The Quilt Show. 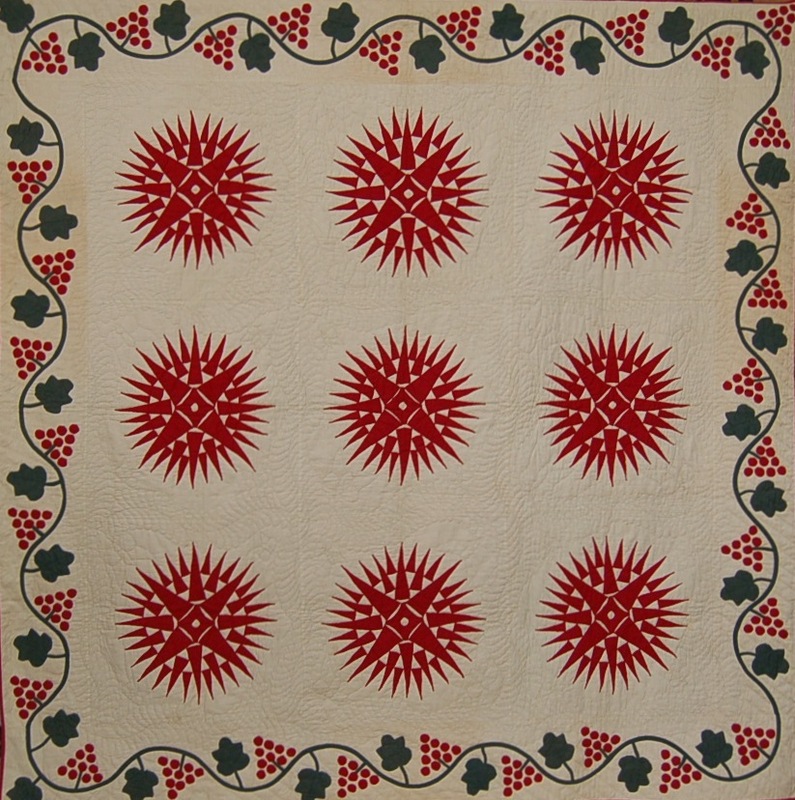 The Great Western Virginia Cover-Up: Historic Quilts & Bedcovers is open now through January 5, 2014 at the Virginia Historical Society in RIchmond, Virginia. The exhibition presents more than thirty bedcovers made in western Virginia between 1800 and 1950. The show examines patterns, methods, and fabrics passed down through generations of Virginia families. For more information, visit the Virginia Historical Society’s website.